Together with your team you can customize Fusioo to fit the way you work. Fusioo helps you improve your workflow and get things done. You can use Fusioo's real time notifications, @mentions and discussion threads so that no information can slip to the cracks. Real time notifications. Stay on top of what you and your team are working on. Assign tasks, projects, issues, leads, support cases and more. 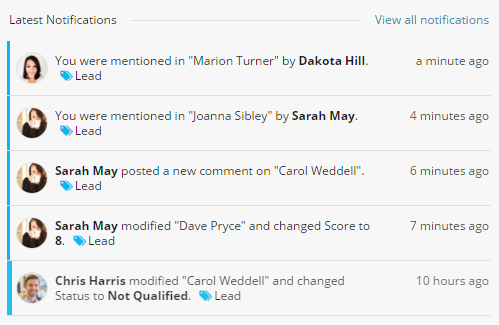 You will get notified in real time whenever one of your team mates updates anything you are following. Notifications hub. All your recent notifications are just one click away. You will get an overview of what is going on, including your @mentions, record updates, comments and ongoing workspace modifications. In context discussions. Want to know the status of a particular project or task? Fusioo helps you keep everything in context with activities and discussions. No more searching through hundreds of emails. Whenever you want to check why a project was delayed, you will find the answer right there, within the project itself. @Mentions. 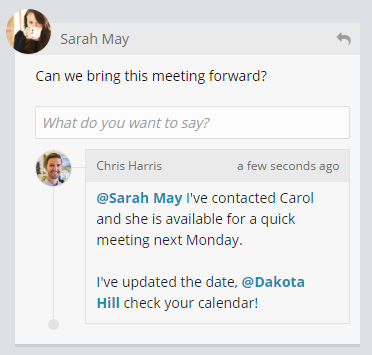 You can @mention team members to grab their attention when their advice is needed in ongoing discussions.